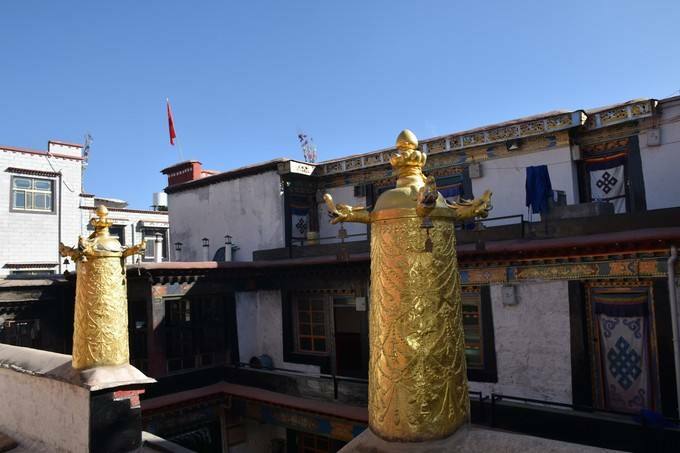 The original Barkor Mani Lhakhang include a pair of prayer-wheel temples on the northern stretch of the Barkor in Lhasa. It is a chapel that houses a huge prayer wheel set almost continuously in motion. To the right of the building is the grandiose entrance of the former city jail and dungeons, known as the Nangtse Shar. Within few minutes walking from Jokhang Temple, please follow your Tibetan guide to visit Barkhor Mani Lhakhang. Miwang Pholane Sonam Tobgyel founded this monastery in the eighteenth century. People commonly called Miwang Khorlo after the founder. The original Mani Lhakhang was razed in the 1960s. In 1989, a replacement Mani Lhakhang was built on a different location in the Barkor, on the open square in front of the old Nangtseshar courthouse. This is just one hour interesting sightseeing tour. So try to include this site during your Lhasa tour. You can learn more about Lhasa tourist attractions. Should you have any questions on a budget Lhasa tour with authentic Tibet travel experiences, please contact us now by [email protected]!